Giant stone axes found in Africa! I have received confirmation on giant hand axes of Africa! Giant hand axes found in African desert! ScienceDaily has an article of giant stone tools found in the dry basin of Lake Makgadikgadi in the Kalahari Desert of Africa. Professor David Thomas of the University of Oxford has confirmed that four of the hand-axes they found were more than 30 centimetres long! An article in ScienceDaily is telling that Oxford University researchers have found thousands of stone tools in a lake bed, now-dry basin of Lake Makgadikgadi in the Kalahari Desert in the southern Africa. Most of them of normal size but they also found four giant stone hand axes, measuring over 30 cm long - believed to be the world's largest stone tools ever found! Although the first find was made in the 1990s, the discovery of four giant axes, of uncertain age, has not been scientifically reported until now. Professor David Thomas, Head of the School of Geography and the Environment at the University of Oxford, and co-researcher Dr Sallie Burrough were trying to document how humans in Africa adapted to several substantial climate change events during the period that coincided with the last Ice Age in Europe. - Some, very, very large stone tools or hand axes, so big that they're perhaps the biggest hand axes that anyone has found anywhere. Over 30 centimetres long, so they are vast, and they are very, very heavy as well! - Well, that is the million dollars question. For the archaeologists this is the big unknown. Various suggestions have included that although they look like tools, they really aren't tools, they're part of a resource that smaller tools would be taken from, to other people suggesting that they had some ceremonial or ornamental role, another alternative is that they are practise pieces. 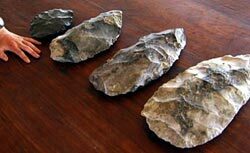 Training pieces for people to demonstrate how you make stone tools. I thought that the story of the giant hand axes was very interesting and send an e-mail to Professor Davis Thomas. He was kind enough to reply and his answer was positive: He could confirm that the four stone axes were indeed over 30 centimetres long! I did not ask if he had given some thoughts that "the big unknown" could be that the stone axes had been used by a race of prehistoric giants - because to answer positive to such a question would most probably be to commit career-suicide! Well, another person that supposedly has found giant stone axes is Rex Gilroy. I will try to get in touch with him, because he believes that all the giant stone tools that he and his wife has found in Australia were made by a former civilisation - a mysterious white-skinned race of giants that created an advanced stone-age megalithic culture! I read the story "Giant Stone-Age Axes Found In African Lake Basin" http://www.sciencedaily.com/releases/2009/09/090911134624.htm and I wonder if you please can confirm that it was four huge hand axes (in the picture) that was found. "Four giant stone hand axes, measuring over 30 cm long and of uncertain age, were recovered from the lake basin." Hi it was indeed 4 over 30cm long. Pl go to my web page at geography, uni oxford, for details and links to radio interviews.